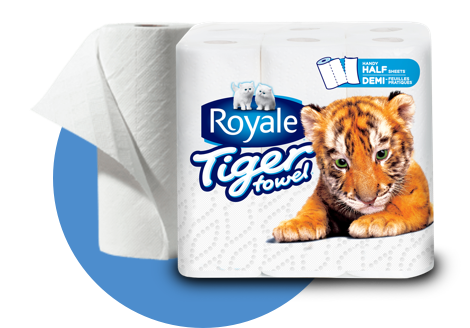 Not only does ROYALE® Tiger Towel® handle cleanups quickly, it’s a spooktacular sidekick when it comes to party prep. Carefully apply a generous amount of hot glue along the entire top of each roll. Create a ring of glue on the inside of the roll, about 1 inch down. Once dry, this will act as a shelf to hold your tea light. Stand the rolls upright to dry and cool down. This will create the melting wax look. Spray paint each candle and let dry completely. Using your needle, thread a piece of fishing line through the paper towel roll. Tie the ends of the fishing line together and secure with a knot. Repeat for each candle, varying the lengths of the fishing line so the candles hang at different heights. Place your tea lights inside the roll. Hang your candles from the ceiling, in a doorway, off light fixtures or from curtain rods and turn out the lights to complete the illusion.